When the ice storm hit Nashville in February 2015, schools were closed for more than a week. Two weeks later – at the beginning of March – schools were closed again for a snow storm. As a result, the Nashville Symphony had to cancel three mornings of Young People’s Concerts at Schermerhorn and a run-out concert to a local high school: we missed 7 performances, which would have put the orchestra in front of around 10,000 students total. When the weather had passed and all the staff were able to get back in the hall at the same time we held a meeting to comb the calendar for the possibility of making up these canceled events – our Young People’s Concerts (YPCs) are the symphony’s flagship education program, an important component in the execution of our education mission. Usually these concerts are scheduled more than a year in advance, due to the difficulty in finding times when the availability of the orchestra, the conductor, scheduled guest artists, the MNPS school calendar, and the hall all line up and allow time not only for performances but rehearsals also. Young People’s Concerts are written into the initial schedule for the orchestra each year for this reason – it’s nearly impossible to find adequate dates and times when all these elements align mid-season. At the end of the meeting, when it became clear that it was not going to be possible to schedule make-up YPCs, I asked Sonja Winkler, our Senior Director of Operations and Orchestra Manager, if it were possible simply to reserve the hall for an alternate program – and it was. Sonja put a hold on a couple dates for us and One on a Part was born. Since beginning my tenure here I’ve been incredibly impressed with the Nashville Symphony’s Onstage series, in which our orchestra musicians present free chamber music concerts to the community. Once or twice a month our musicians perform chamber concerts in an intimate environment which encourages dialogue between the musicians and audience, in programs they choose (repertoire and personnel) and rehearse themselves. So I thought: what if we presented a chamber music concert in similar spirit to students? Our YPCs are designed for four age groups: grades K-2, 3-4, 5-8, and 9-12. The concerts canceled in February and March were for the two youngest groups, so it made sense to write a program that would target grades K-4. Without the sonic grandeur of the orchestra to carry the children through a forty-five minute program, it was clear that we would need a different approach. 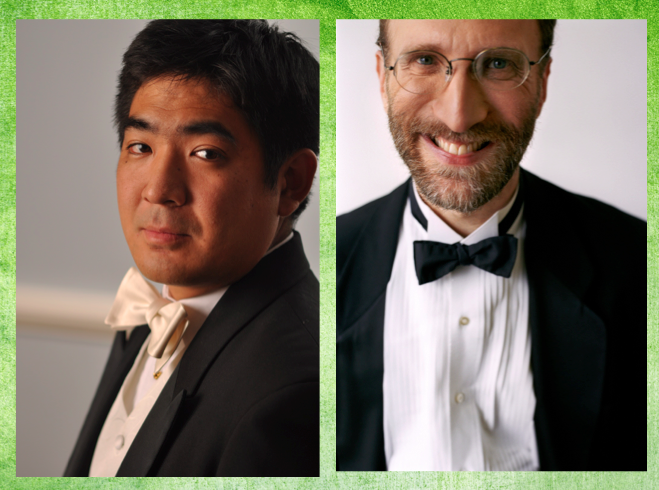 I came up with the basic concept for the show and met twice in early March with Jun Iwasaki, our concertmaster, and Roger Wiesmeyer, our English Horn player, who also plays oboe and piano, and serves as Chair of the symphony board’s Education and Community Engagement Committee. Once I explained the basic program to them, Jun and Roger ran with it, quickly choosing repertoire and helping me recruit players. In the end we decided on a program featuring movements or excerpts from nine pieces, for which we would need ten musicians. Programs for children that are presentational in format are usually most successful when driven by a narrative. My initial idea was to begin the concert with a solo, thereafter adding one instrument at a time and growing the ensemble with each successive piece. This format would put before the students a wide variety of ensemble timbres, great music, and would introduce students to the vocabulary not only for the instruments themselves, but for each ensemble. Jun and Roger chose a duet, trio, quartet, quintet, sextet, septet, and octet: music by Handel/Halvorsen, Mozart, Beethoven, Prokofiev, and Schubert, and decided to end the show with the finale from the Grande Nonetto in F Major, Op. 31 by Louis Spohr (1784-1859) for flute, oboe, clarinet, bassoon, horn, violin, viola, cello, and double bass. Jun never told us what he was going to play as the opening solo – in the end he played a selection from a Bach Partita. We decided that Roger would narrate (he also played piano on the Prokofiev and oboe on the Spohr), so we settled on a “cast” of ten musicians. I recruited personnel from members of the orchestra and played librarian, getting parts to everyone in time for the first rehearsal. One of the biggest challenges in putting this project together was finding times when every musician was available to rehearse (they had already committed to the performance times). 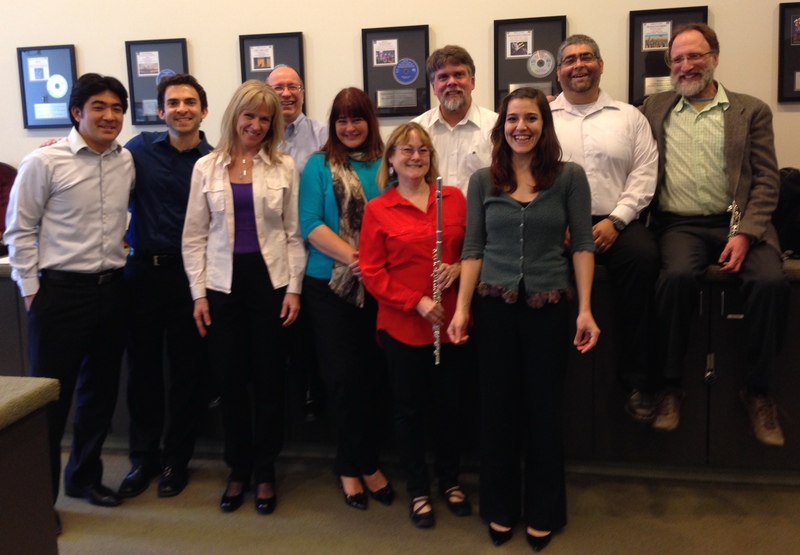 We held our first rehearsal on April 11; as an example of how busy they are, they had performed in our last Pied Piper concert of the season that morning, and played the last date of our string of performances with Bernadette Peters that evening. Roger and I went out to dinner one night with Kelley Bell, our Education & Community Engagement Program Manager, and the three of us wrote the script. Roger had the clever idea of announcing that a snowstorm had hit just as he was arriving, to explain why the musicians were late. Roger was given a comfy armchair on stage right, and all the players wore a coat when they made their entrances and piled them on a table before joining the others. Because a stage hand was required to bring chairs and stands on between each selection, we wrote him into the script too – this part was played by Assistant Production Manager Trevor Wilkinson. We somehow managed to get a few jokes or funny turns of phrase into the script – the main function of which was to tie all the musician’s entrances together and introduce the vocabulary, the instruments, and the music – which Roger deftly augmented with improvised jokes of his own during the performances. After the script was finished, Kelley and Education Department Intern Brooke Semar put together a Powerpoint presentation to project above the stage featuring the vocabulary and illustrations. We held the dress rehearsal at 8 am the morning of the first performance on April 22 – that was an eye-opener! I’ve never seen symphony musicians that early in the morning before. Everything came together that day – we worked out blocking and entrances, ran through all the dialogue and music, and Trevor got the purple cast out of the Powerpoint (it was a faulty projector cable) before our volunteers and ushers led over 1200 children into the hall for the 10:15 show. Yesterday morning we held back-to-back performances, which were attended by over 2800 students total. In all we put on three performances, each of which got progressively better. Everyone involved seemed to truly have an enjoyable time, the musicians played with verve and excitement, and the students and teachers who attended were very enthusiastic. 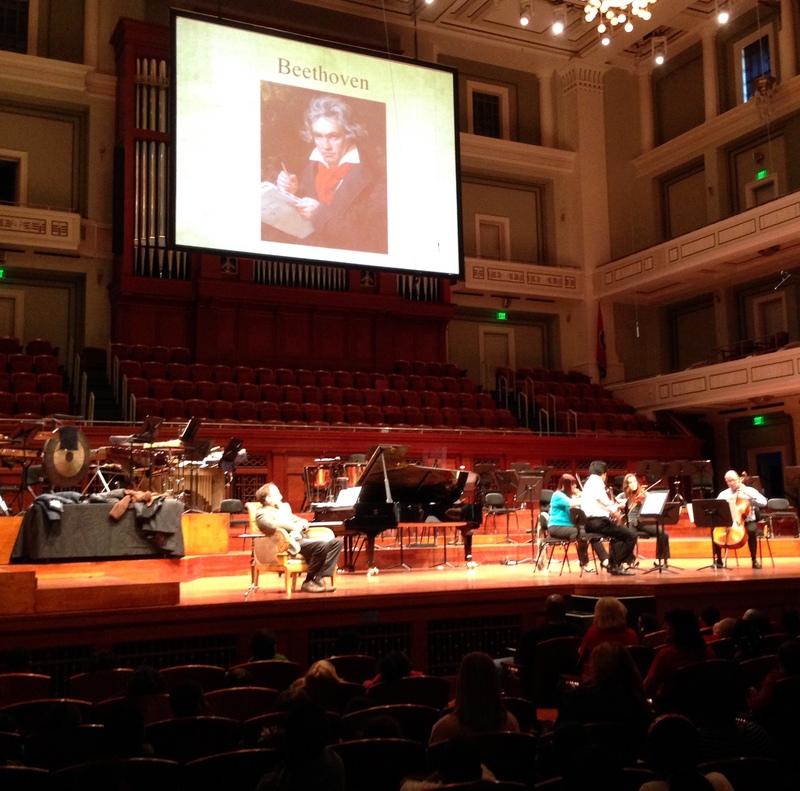 Not only did we succeed in providing an alternate experience of great music at the Schermerhorn for thousands of children who missed hearing the orchestra due to bad weather this winter, we created a new program for the Education & Community Engagement Department at the Nashville Symphony. 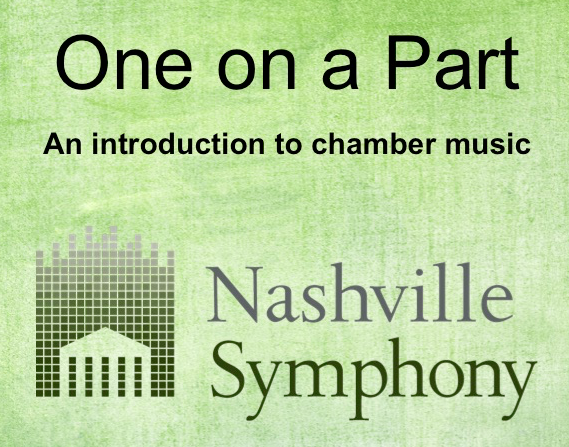 One on a Part will become our new format for educational chamber music concerts – Roger and I are already discussing a program for middle and high school students for the fall of 2015. 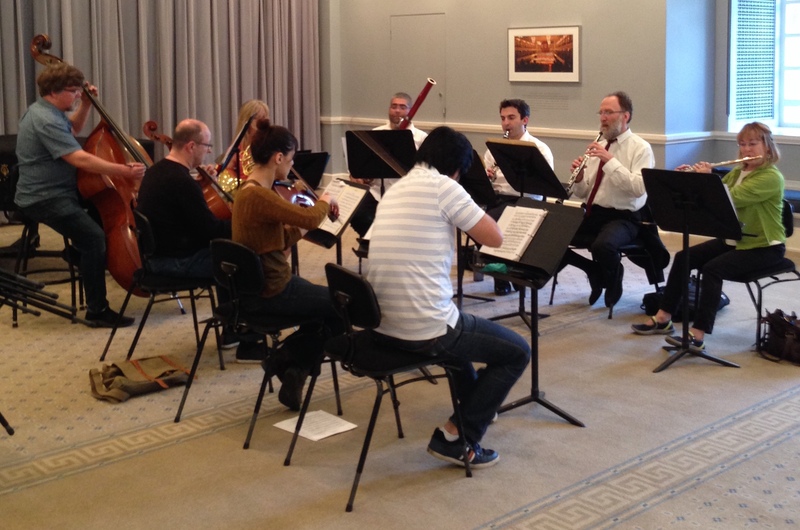 By walterbitner in Chamber Music, Nashville Symphony, Nashville Symphony Programs on May 2, 2015 . Hi Rebecca – please do bring your students. I am looking forward to reading the Berlioz, thanks for the recommendation! This idea is so innovative. So good to see your creative touch taking the symphony ‘s mission to new levels. Looking forward to how this fresh crop of concerts evolves.